Busy Weekend…..Camping with the Group….and Mileys 6th Birthday Party…. – …………. ''AND LET THE FUN BEGIN''……………..
Busy Weekend…..Camping with the Group….and Mileys 6th Birthday Party…. Last weekend, we camped with our group, Cenois Prairielanders. We started out on Thur. nite. Rich got home about 7, and we hopped in the MH and left. Of course we also took Kitty. This is his second camping trip and he did so good. He was scared at first but he actually walked around some. He is getting more curious all the time. We knew we wouldn’t make the campground before dark, so we stopped at a McDonalds truck parking lot. That is the beauty of a Motorhome. But it is a good think to read signs too. The small sign said as we drove in, No parking overnite. Prohibited by the town ordinance. Oh well, we took the chance and parked anyway. I was waiting for the police to come knocking at 2 in the morning, but all was well. In the morning we got up and had breakfast at a restaurant about half a block away. On we went to Peoria, and stopped at an RV place and filled with propane. We had to have propane to run the furnace. The weather is getting pretty chilly. On we went to the campground. This was the first time to Kentuckiana . What a fabulous campground. It is so geared to the kids and a great family atmosphere. We met up with all our friends from the Cenois Prairielanders group and met some new ones from the Great River Ramblers. There was a total of 9 coaches. It was a nice group. 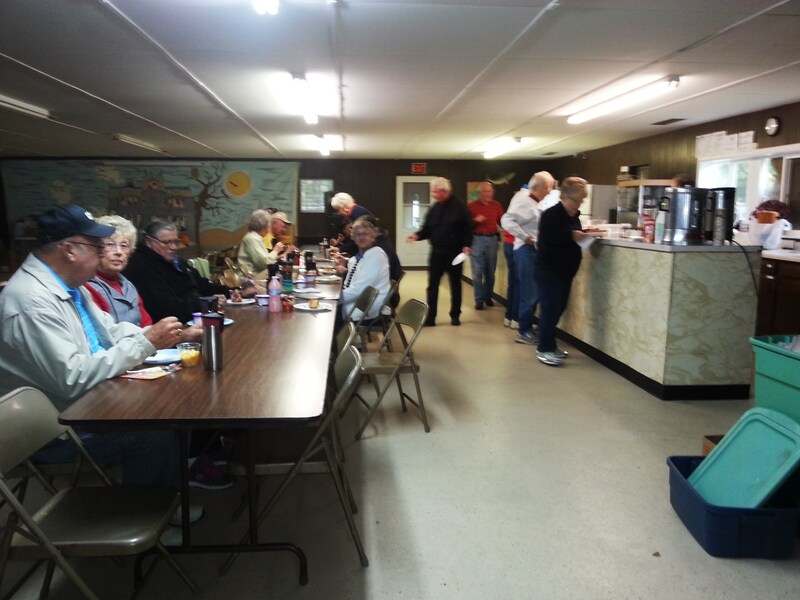 On Friday nite, the campground served a free Chili supper. You had your choice of hot or mild chilli, crackers and a piece of pie ala mode. OMG, They had pecan pie. It was So so good. Saturday the ladys took off to a Tea Room in Mackinaw. It is called “The Garden Gate”. It is such a cool place. It is a renovated old Railroad Station. The rooms are all packed full of so many gift ideas, all decorated for Halloween and Christmas. The coolest thing about it is the meal. They are known for serving their meals on a 3 tiered serving rack. If you order a soup, entrée, and dessert it comes served on this cool beautiful rack that is placed in front of you. We shopped and then stopped across the street at the “Porcelain Berry”, which is full of so many wonderful things, from jewelry, clothing, purses, to home gadgets. We all returned and had a great time and all spent money…..lol…How can you not…. The men did their own thing. They went to a Modular home manufacturing factory…..HomeWay Homes….They have tours every Saturday at 1. They seen a house built from scratch to finish. They can built about 2 homes a week and sometimes more. After that they went on down the road to the sales site. They had 2 complete homes on display for everyone to go through. Sounds so interesting. I would really like to do that to. I love touring homes, especially seeing how they are built. After we all got back to the campground, we rested a bit and then drove to Minier for Supper. It was just a small town bar and grill. But guess what the specials were? All you can eat barbeque ribs and Prime rib. Well I had the prime rib and Rich the Ribs. OMG. So so full. Back to the campground. The one really cool thing about this campground is, every Saturday nite they have a country singing group. We went back and sat through the first half and then time for bed. All that food really did us in. The next morning we all had breakfast together. (more food)….lol….It was really a chilly weekend so we eat our breakfast on Sat. and Sun. at the Campgound hall. Here are a few more pics of the campground. They have 2 really pretty ponds for fishing and just pleasure. Also several gazebos scattered around and some beautiful flowers. After that we hightailed it home. We left at 10:00 and had to be in Spring Valley Boat Club around 1……It was Mileys 6th birthday party. We made it and even made the taco salad that I always bring. That seems to be the kids favorite thing for me to bring. Tina always throws great birthday partys for the kids. This year Miley picked the theme Frozen for her party. She always gets so many cool presents… If we were only 6 again. Ed had a Pinata outside, and talk about fun…The kids had a blast. Heres a few more pics that are so darn cute, I have to add them…. Granpa and Cassidy…He was tickling her….